So lately I've been very busy. I've got an internship at the biggest newspaper of the Netherlands. And as you can imagine, that is crazy and it makes me feel a lot of pressure about the articles that I have to write. It is fun though, I learn a lot and I’m allowed to do some cool stuff. Still it takes up a lot of time and I have to make long days and long travels. So that's what I've been up to these past three weeks actually. 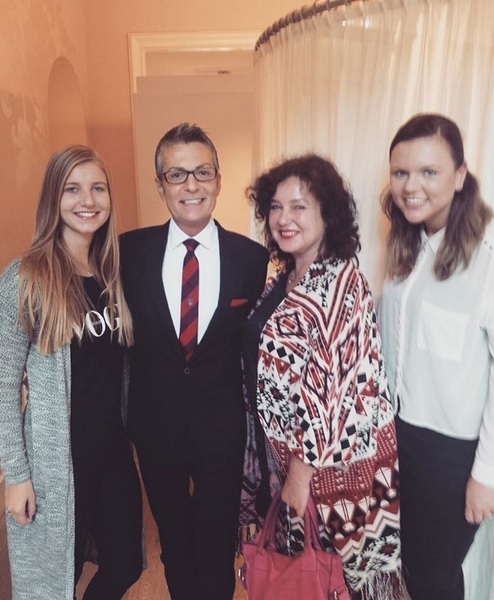 But what I’d love to tell you is that yesterday I got the chance to meet Randy Fenoli. You know him from the TLC program Say Yes To The Dress. (Do I even have to tell you that?!) I didn't interview him but I helped carrying the camera and had to write a ghost article. That is like writing an article but it never gets published. So my coordinator can look at it and help me getting better at writing. So I was pretty nervous about that! Randy is a very kind man. When we came in he shook our hands and we all got greeted by a 'Hello beautiful'. Then we introduced ourselves and he could not pronounce my name right. My name is 100% Dutch so I don't really mind that it goes wrong. It’s just hard for people who are not Dutch to say my name. I always say: it's something like Rihanna, the singer. He apologized like three times but I said that it was all right. Then we quickly started with the interview and because we only had half an hour it was soon over. I mean, that half hour felt like two minutes. Randy also showed us his book and now I want it so bad. I'm not getting married soon, but who doesn't want tips from Randy about finding The Dress or just dream about their wedding! My internship is for 5 months. I try to post as often as I can. But it’s very busy and all. I’ll try to keep my promise: every Monday a new post! What have been up to these weeks?